Looks like an original to me what do you all think ? They must have made some other changes to their plates when they added X codes then... that plate is different in several respects from my late Norwood data plate. They did make a bunch of changes when they went to the large format tags, like they were made pn completely different machines, different font, different spacings etc. The early norwood tags are the same as all of the LA tags as they never went to the larger format tags. Theres nothing of interest on this tag as it only indicates interior and exterior colors similar to the 68 tags so there really no reason to change it unless you were changing the color of the car on a high end restoration. This one appears to be in primer so I wouldn't think that's the case here. Someone did that the tag off some time in its life, see the little gap between the tag and the rivet that means the rivet is loose, and also the smeared and flattened out filler, those are both signs the tag has probably been off at one time or another. But as long as the VIN matches the 11C build date I wouldn't worry about it. That 'gap' at the bottom of the rivets looks to be a shadow from the angle the picture was taken at. An unmasked flash on a typical camera is a direct source of light so it will tend to highlight shadows around crisp edges. Tag looks okay, but I agree with Mark, it had been off the car..., so check the VIN date..
except for the counterfeit thing.... what other reason would anyone take the trim tag off the car? They didn't know it was not the right thing to do during a restoration. 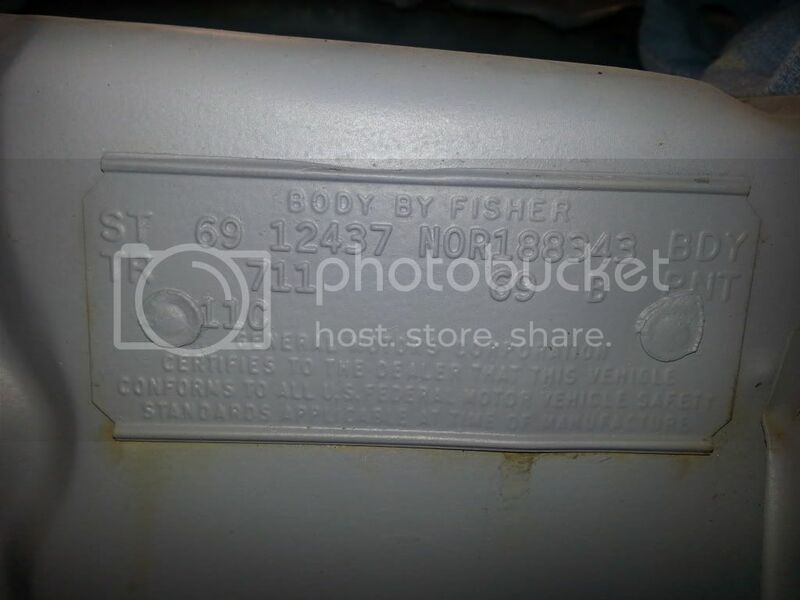 Should the body number be that different? Here it is..tried to attach image.. Assuming body numbers assigned in sequence with the car order, then your car would have been ordered considerably in advance of the other order (ie. 26,000 cars or a month to month and a half of production), yet built the same week. At that time of year, first quarter of production of a new model, we can assume orders were coming in more heavily than later in the year. I think it's difficult to say if the body numbers would have been that different or not..? Was your car ordered with one or more low production options which might have delayed production? OR the other car could have been a 'customer ordered car', which moves up in the production sequence. OK In my opinion the tag is original and when removed has never been off the car . The car is original silver,blk top,and blk std interior. We see no reason for the tag to have been changed really a nothing car to worry about. But here is the vin and everything lines up.123379n547xxx . not real sure if it was infact a 6 cyl car or 8. but the mounts were removed at some point and it had small block mounts. I don't think that tag was removed. It looks like it has a few coats of paint or primer and so the rivet heads have a built up thickness and the flash is exaggerating the shadow along the bottom edges to make it look like there is a gap. But, without seeing it in person we can only go by the accuracy of the photo.